After traveling the North West USA for a week, your correspondent (together with Mrs TFC) finds himself in Seattle for a few days. We spotted a fantastic map store on our walk last night and resolved to return during its opening hours. It is called Metsker Maps. They have lots of great things for sale, for the budding cartographer or astronomer. 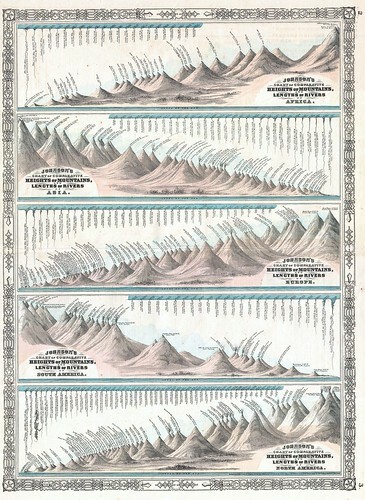 But without a doubt, the coolest thing we spotted was this Johnston’s comparative map of the world’s major rivers and mountains. It is a reprint of the 1864 original. This ‘Johnston’ character was the USA’s preeminent entrepreneur cartographer in the late 1800s. The comparative style was originally developed by a fellow called Colton, but Johnston was perhaps a more savvy businessman and he bought Colton’s company. This map was Johnston’s first edition of the updated Colton style, in which the rivers and mountains were separated according to continent. This alleviated the effect of the Himalayas over-shadowing every other mountain. Straight to the pool room.